What do you do when an American dad on a big fat expat relocation package with beaucoup disposable income asks you to help pick out a gift for his wife that's quintessentially French? You say, "bien sûr. I'm flattered that you asked." Then you take daddy to Hermès. The Hermès flagship boutique, 24 Rue du Faubourg Saint Honoré. La Mom, Chicago Dad, La Vendeuse. Le gift: A Birkin bag. La Mom: You need to get Chicago Mom a gift that's the epitome of French style. Something that will always remind her of the years spent living in Paris while you climbed the corporate ladder. She needs a Birkin. Chicago Dad: A what? Like Jane Birkin? La Mom: Exactly. A Birkin bag is a classic Hermès leather accessory that any French woman with money and taste has in her wardrobe. It's a staple. Elegant. Classy. Timeless. Definitely worth the investment. And très French! Chicago Dad: Ok, sold. Now help me pick one out. La vendeuse: Puis-je vous aider? La Mom: Did you hear the sales lady ask how she could help us? That's so un-French. Chicago Dad: La Mom, I just realized...is THIS the Hermès store that had an incident with Oprah a few years ago? Didn't they close the store on her before she finished shopping? Am I shopping in a boutique that Oprah Winfrey has shopped in? So cool! La Mom: This is the one and only. Chicago Dad: S'il vous plaît, I'd like to buy the olive bag. La vendeuse: Un très bon choix, Monsieur. That will be 12,000 euros. You can pick up the bag next May. Chicago Dad: As in 2012. There's a one year wait? La vendeuse: Mais bien sûr. Here's your reservation slip. Merci and see you next year. Chicago Dad: Don't you need a deposit? It's a 12,000 euro bag after all. La vendeuse: It's not necessary. Chicago Dad: But what if I don't come back in a year to pick it up? La vendeuse: Oh Monsieur, don't worry. If you don't come back to buy it, someone else will. It'll be sold in ten seconds flat the minute I put it on display. La Conclusion: Try Louis Vuitton if you want to avoid a one year wait for a luxury French handbag. Louis Vuitton flagship boutique: 101 Avenue des Champs-Elysées, 75008 Paris. Frank Sinatra sang it best when he sang, "I love Paris in the spring time..."
Can't make it to Paris this spring? Pas de problème! 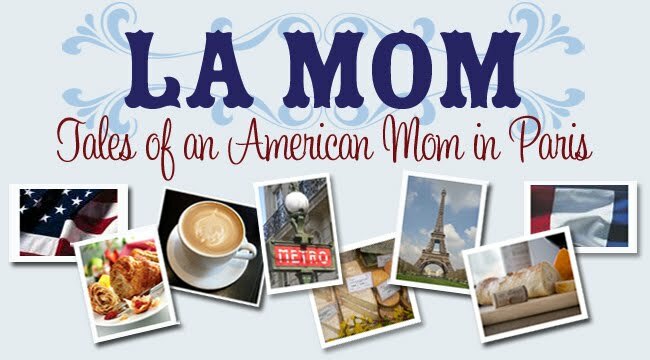 All you need is a little La Mom, your BFF in Paris, to help you feel like you're here. Check back next week for more exciting adventures in the City of Light! Oh, and check out FiFi's Paris paintings too. They are superbe!